Zeus found me through ABR about three years ago. He’s the first dog I’ve had as an adult and is, without a doubt, the best dog I could have gotten. Jen Pope is the boxer whisperer. When I went to meet dogs, I wanted a female with a docked tail. She introduced me to Zeus, a male with a natural tail, and it was love at first sight. Since he joined the family, we’ve moved from San Antonio to Yorktown VA. He travelled like a pro. He lets all four cat “brothers” be alpha. The most Zeus ever does in response to their silliness is move. His best outside friend is Casper, the neighbor’s cat. They play their version of tag in which my Z-man is always the chasee; Casper is the chaser. They both love their game and it carries on across both yards. His favorite walk is in a nature park along the Chesapeake Bay, where he can run off-leash to dip his toes in the water. If he has a dog buddy with him, he forgets he’s not a water dog and dives right through the waves. He always looks so surprised when he pops out the other side, but always goes back for more. This picture is a perfect depiction of my 75-pound goofball. 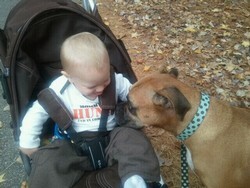 He is a gentle soul who loves little kids and just knows he has to be quietly friendly, not boxer bouncy. All the kids in the neighborhood love him, as do I. Thanks Jen and all the ABR volunteers for all you do for these wonderful dogs.